Rhiannon joined the Midway family in 2014 as an intern during her summer vacation. She graduated from Virginia Tech in May 2015 with a Bachelors of Science in Animal and Poultry Sciences. 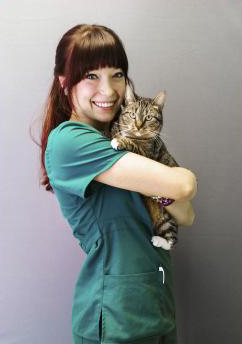 After graduation, she joined the MVH team permanently as a Veterinary Assistant. Through Midway, Rhiannon adopted a feisty, tail-less kitty named Nesta, a tuxedo cat with a perfectly groomed moustache named Jake, and a fearless budgie named Gale. Rhiannon recently found and adopted Ollivander, a magically sweet stray kitten from the oceanfront. In her spare time, Rhiannon enjoys surfing, tie-dying, and spending time outdoors. She looks forward to continuing her education and experience in the veterinary field under Melody by completing her associate's degree in Veterinary Technology!